Manchester United did extend the lead at the top of the Premiership to fifteen points on Saturday away to QPR, but it was only for 24 hours, as two splendid second-half goals from Yaya Toure and Carlos Tevez helped Manchester City to a win over Chelsea and reduced the gap at the top to 12. In the Saturday afternoon televised clash, Martin Jol’s Fulham gained a narrow 1-0 win over Stoke at Craven Cottage. The Cottagers had thought they had took an early lead but a Bryan Ruiz goal was struck off correctly by referee Lee Probert for handball. It was all Fulham in the first half and Dimitar Berbatov was in rare form, in his 200th Premier League appearance grabbed the only goal with a special strike. On the stroke of half-time, the Bulgarian hit a powerful left foot volley after Robert Huth failed to clear past Asmir Begovic. Jonathan Walters’ bad luck continued when his 55th minute penalty was saved by Mark Schwarzer. 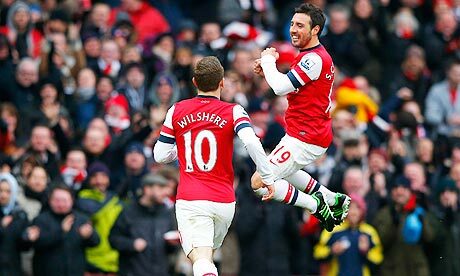 Spanish maestro Santi Cazorla saved Arsene Wenger’s bacon at the Emirates as his last-gasp winner gave the Gunners all three points. It was not all doom and gloom for Aston Villa, although they remain one point above the relegation zone, on this evidence, they certainly have the players to steer away from relegation. Cazorla opened the scoring in the sixth minute after Nathan Baker blocked Cazorla’s initial shot after some good work by Jack Wilshere, but the Spaniard made no mistake with his second effort, slotting past Guzan with a beautiful curling effort. Urged on by manager Paul Lambert, Villa pressed for an equaliser throughout the match but failed to do so until the second half. Carl Jenkinson failed to clear a long punt down field, the ball made its way to Austrian striker Andreas Weimann and he went on a blistering 40-yard run before beating Wojciech Szczesny with a weak shot. Wenger rose from his bench with dissatisfied fierce look at his team. His troubles nearly worsened soon after when Christian Benteke found space at the back post but Per Mertesacker got in front of the Belgian before he could head on goal. Arsenal piled forward for the remainder of the game and got their reward five minutes from time when Nacho Monreal swung the ball into the box and Cazorla converted, much to the relief of Wenger and the home fans. Norwich talisman Grant Holt grabbed a dramatic stoppage time winner as Norwich City overcame Everton 2-1 at Carrow Road. Both teams started the game well but it was the David Moyes’ side who had the better of the opening exchanges, most notably Nikica Jelavic who repeatedly found space in the box but failed to capitalise. Norwich did show signs of invention but it always seemed as if it was only matter of time before Everton took the lead and they finally got their reward on 39 minutes, as in-form left-back Leighton Baines picked out Leon Osman with a cross and he stooped low to head home. Everton continued to push after the break but everything changed when Kei Kamara was introduced for Norwich on the hour. The Sierra Leone striker, loaned from Sporting Kansas City in the MLS, made the difference, adding massive drive to the Canaries’ attack, forcing a great save from Tim Howard after 63 minutes before heading just wide moments later. However, he sent Carrow Road into rapture on 84 minutes, rising above Marouane Fellaini at a corner and heading down and into the goal. Chris Hughton’s side continued to push on after that score and after Grant Holt went close on 90 minutes, the skipper grabbed a dramatic winner, latching onto Russell Martin’s deep cross to poke home at the back post. Goals from Brazilian full-back Rafael and Welshman Ryan Giggs, in his 999th senior appearance club and country, made sure Manchester United stayed comfortable at the top of the pile on Saturday evening. Unlikely goalscorer Rafael hit a magnificent wonder-strike from 20 yards to put the league-leaders ahead. Harry Redknapp’s side must have felt unlucky, as they had held their own for the majority of the game but couldn’t find a goal not matter how hard they pushed for an equaliser. The game was settled ten minutes from time when Giggs slotted in the box after a smart pass from Danny Welbeck. A double from Arouna Kone lifted Wigan Athletic out of the bottom three and improved 10-man Reading’s relegation worries at the Madejski Stadium. The Ivorian striker started the scoring with a lucky goal when left-back Maynor Figueroa’s header hit his torso and flew past goalkeeper Adam Federici. He doubled the lead moments later with a sublime finish following Chilean Jean Beausejour’s defence-splitting pass. Figueroa completed the scoring, before falling victim to a dreadful Pavel Pogrebnyak challenge, who was dismissed. The apologetic Pogrebnyak could have broken Figueroa’s ankle and the Russian’s sending off added to Brian McDermott’s troubles. Martin O’Neill’s Sunderland side were dragged right back into the relegation dogfight falling 2-1 to West Brom at the Hawthorns. 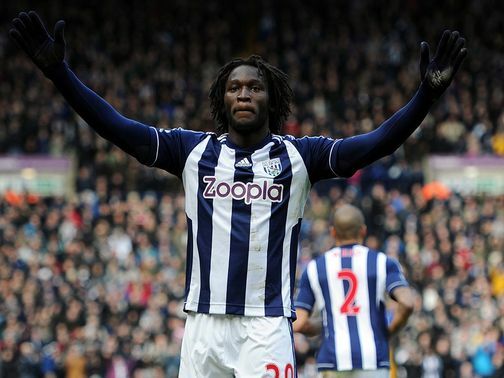 Baggies on-loan striker Romelu Lukaku hit a brace to keep his side’s Europa League qualification hopes alive. Craig Gardner’s handball gave Albion the perfect opportunity to take the lead and Lukaku made no mistake smashing home a 35th minute penalty. The Belgium fortunately doubled his side’s lead when fellow Belgian goalkeeper Simon Mignolet’s clearance rebounded off him. The Black Cats fought hard to get back in the game and Stephane Sessegnon curled home a late consolation, but Albion held on for a deserved win. Yaya Toure and Carlos Tevez earned Manchester City a 2-0 win over Chelsea that gave their fading hopes of retaining the Premier League title a boost. Chelsea had wasted the chance to go ahead early in the second half at the Etihad Stadium when Frank Lampard had a penalty well saved by keeper Joe Hart while City had endured long spells of frustration as their many chances failed. Toure’s sweetly struck shot into the bottom right broke the deadlock in the 63rd minute while substitute Tevez made sure of the three points with a right-footed missile five minutes from time. The result puts second-placed City 12 points behind leaders Manchester United, who won 2-0 at Queens Park Rangers on Saturday to climb to 68 points from 27 games, while Chelsea stay third with 49. It was ‘French Day’ at St James Park and it was their Frenchmen that helped the Geordies defeat a battling relegation threatened Southampton 4-2 on Sunday afternoon. It was the visitors that shocked Newcastle with their very own Frenchman grabbing a goal. Within the first three minutes, Morgan Schneiderlin turned and half-volleyed a shot past Premier League debuting goalkeeper Rob Elliot, replacing the injured Tim Krul. The 33 minute equaliser was scored by the in-form Moussa Sissoko. Great work from the tricky Yoan Gouffran as his shot was saved by keeper Artur Boruc, Sissoko was on hand to slot home his third goal in four games. 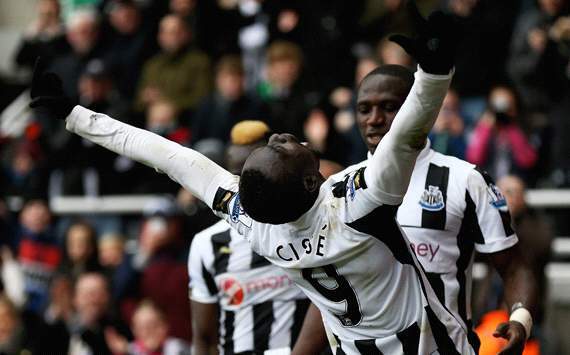 Newcastle pulled ahead nine minutes later with a spectacular effort from Papiss Cisse. Noticing Boruc off his line, the Senegalese forward produced an astonishing long range dipping strike on the half-volley after keeper Elliot had launched a long ball forward. Losing the services of captain Fabricio Coloccini before half time to what looked like a back injury, Newcastle again started off slowly and Elliot was forced into an acrobatic stop to defy Lambert’s well-struck free kick. Southampton had regrouped at half time and levelled shortly after the break when Rickie Lambert turned in a low Adam Lallana cross at the near post for his 100th goal for the Saints. The Geordies regained the lead with a penalty kick after a Mathieu Debuchy cross struck left-back Danny Fox in the arm and Yohan Cabaye placed the ball for the third goal. The victory was secured when Davide Santon’s left-wing cross was bizarrely cleared by Fox which accidentally struck Jos Hooiveld on its way into the Saints goal. It was that man again, Welsh wizard Gareth Bale who helped Spurs fight back to defeat rivals West Ham 3-2 at Upton Park in the Monday night game. It was Tottenham who took the lead when Bale picked up the ball on the edge of the area and hesitated and hesitated before firing back across Jussi Jääskeläinen from a tight position on the edge of the area. Scott Parker landed a poor challenge in the box on striker Andy Carroll and the big Geordie stepped up and smashed home the penalty emphatically to draw level on 26 minutes. Glyfi Sigurdsson entered as a half-time sub and came within centimetres of making an instant impact. His curling shot was pushed onto the post by Jääskeläinen and the ball popped up perfectly for Emmanuel Adebayor who hit his header straight at the goalkeeper… an embarrassing miss. The Hammers made Spurs pay for that miss minutes later. Joey O’Brien clipped an inch-perfect pass for Joe Cole and he took one touch with his back to goal before spinning and hitting his left-foot shot into the turf that bounces over Hugo Lloris and into the far corner to make it 2-1. A lucky scrappy goal levelled for Spurs, Bale whipped in a free kick and the ball ricocheted off a West Ham player against Tommy Carroll’s arms before bobbling around of Steven Caulker and Adebayor and finally being bundled home by Sigurdsson from a couple of yards, 2-2. Bale made sure Spurs left with all three points with a stunning strike just a minute from time. The winger picked the ball up 30 yards out from goal and smashed a stunning effort into the far top corner. Jääskeläinen had an amazing performance even though he was beat three times.